1. Soak potatoes in a large bowl of water for about 30 minutes. Remove potatoes from water then pat dry thoroughly with paper towels. 2. Heat oil in a deep-fryer or large saucepan at low heat. Gently add the potatoes in the hot oil for about 5 minutes, stirring and flipping the potatoes occasionally. Remove potatoes from oil to drain on paper towel and to cool completely. 3. Heat oil in a deep-fryer or large saucepan at medium heat. Fry the potatoes again until golden brown, 5 to 6 minutes. Blot with a paper towel. Sprinkle with salt to serve. 4. Serve and enjoy your crispy fries! 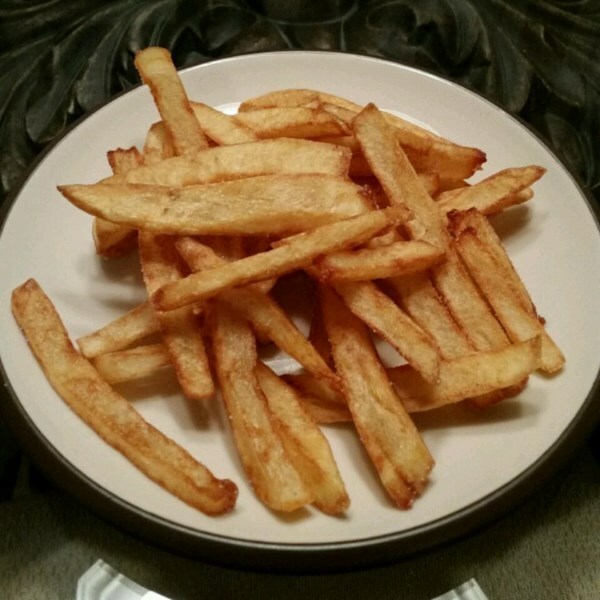 This entry was posted in Appetizer Recipes, Merienda Recipes and tagged Fries, potato by Panlasang Pinoy Easy Recipes. Bookmark the permalink.